Actually, Its a great thing. All thanks to FCC. I am also going to join online. Its always great to be a part of FCC community. Yesterday evening I submitted mine also. I have a question: Do we have to make a fancy index page in order to win the ticket? Or how the tickets get assigned after we submit our web app? Thank you @FreeCodeCamp and @QuincyLarson for all these great opportunities for all of us campers! We really appreciate all you do to keep us on the top! The instructions were very clear and easy to follow! I will join the hackathon online too! This will be my first one also! I haven’t got the ticket yet, still waiting. Is this hackathon only applicable to the FCC campers only? How to get online registration link for online hackathon ? 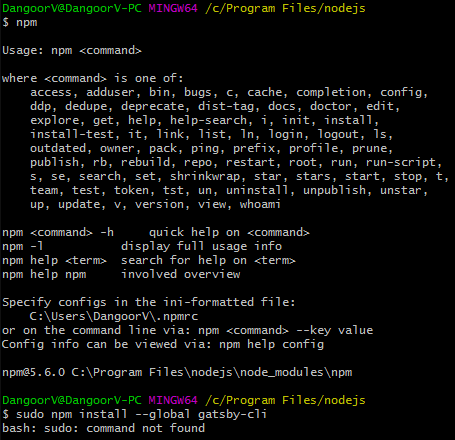 As for the npm: command not found , means you don’t have npm installed on your machine. You will need to do so first before installing gatsby. Git Bash can be used on Windows 7. But you don’t have to use it (or the Linux Subsystem on Windows 10) to run any Node.js/NPM commands, as those commands are OS-agnostic. You can just as easily use the Windows CMD or PowerShell. I personally recommend using PowerShell on Windows as it supports a variety of Linux commands (not all of them, but enough to be useful), and is more flexible to use than either Git Bash or the Linux Subsystem (on Windows 10). i am using gitbash … i have 64 bit ,windows 10…is it fine? or should i use wsl? Can we use react with webpack? i did not understood step 12 …can anyone help me plz…? You don’t have to make the index page fancy. Even making a slight change to the HTML will be fine. The main thing I’m looking for is that you were able to open up the right file in your code editor, make changes, and commit the changes, then push them live to Netlify. Anyone can apply for a ticket, regardless of whether they are active in the freeCodeCamp community. Thank you @MonikaPatelIT Good luck to you too. Hi @vamsikrishnareddybev , Have you solve the problem? I am having it too, kinda. I have already NPM since I installed Node.js before. when I am running just the npm command I see npm deatils. I got a similer message. I have Win7 64bit, running Git Bash. Be glad for any help @rookieblue0001 from you too. Is this OK to go to the next steps? Just got done and applied for a ticket to the online hackathon! Thanks for getting the word out on this, Quincy!